Hawai‘i's Official Tourism Site - Contains information about upcoming events and activities, sightseeing, accommodations, and more. (Chinese, German, Japanese, and Korean language versions available as well). Visit O‘ahu - Information specifically about O‘ahu including sample itineraries, activity ideas, events, and more. (Chinese, German, Japanese, and Korean language versions available as well). Get in some quality beach time - Hanauma Bay (snorkel in an extinct volcanic crater), Kaliua Beach (beautiful beach for taking strolls), North Shore (famous "pipeline" surfing beaches), Ala Moana Beach Hotel (right by the conference hotel), and more await all around the island. Museums to feed the cultural soul - We have many museums featuring Asian and Pacific art, such as the Honolulu Museum of Art and the Bishop Museum (which has the largest collection of Hawaiiana anywhere as well as exhibits for the kids). Iolani Palace - Iolani Palace, the official residence of Hawaii’s monarchy, is a marvel of opulence, innovation and political intrigue. Meticulously restored to its former grandeur, this National Historic Landmark in downtown Honolulu tells of a time when their Majesties, King Kalakaua, who built the palace in 1882, and his sister and successor, Queen Liliuokalani, walked its celebrated halls. Reservations required. Paradise Cove Luau - Experience Hawaiian crafts, arts, food, song, and dance at a luau in the Ko‘olina resort area in western O‘ahu. Take a walk on the wild side - Conveniently located in Kapi‘olani Park, we have the University of Hawai‘i's own Waikiki Aquarium as well as the Honolulu Zoo. Hawaiian Culture and Language - Learn about Hawai‘i's history, culture, arts, and language. Visit Shangri La (Doris Duke's Center for Islamic Arts and Cultures) - A tour of Shangri La is a unique and memorable experience designed to introduce the visitor to the world of Islamic art and architecture as interpreted through the Doris Duke Foundation for Islamic Art’s collection and the architectural elements found throughout Shangri La. Tours originate at the Honolulu Museum of Art where visitors begin their experience with a tour of the museum’s Arts of the Islamic World Gallery and a ten minute introductory video on the history of Shangri La. The entire tour experience lasts approximately two and a half hours with one and a half hours on site at Shangri La. Tours are offered regularly Wednesday through Saturday starting at 9:00 a.m., 10:30 a.m. and 1:30 p.m. Tickets must be reserved in advance. Go take a hike! - O‘ahu has many lovely places to take a hike such as the Makapu‘u Lighthouse (good for whale watching in the winter months - bring binoculars), Diamond Head (panoramic view of Honolulu), and Mānoa Falls (near UH's Lyon Arboretum). Don't forget to bring water, appropriate clothing, sunscreen, and potential insect repellant, and please take necessary cautions to have a safe hike. First Fridays in Chinatown - Join local folks and visitors alike on the first Friday of every month for Chinatown's First Friday evening festival. Chinatown and downtown galleries, museums and studios are open to the public for this popular event that provides an opportunity to experience the artistic and cultural resources of Honolulu. Festivities include live music, street entertainment, open cafes and bistros. antique stores -- and even a tattoo parlor. A free gallery walking map is available at all participating sites. Honolulu Night Market - A monthly celebration with local entertainment, cuisine, arts, and more in the heart of the Kaka‘ako district. Hawai‘i Weather and Surf - For current weather and surf conditions. The Honolulu Star-Advertiser - The Honolulu Star-Advertiser is Oahu's daily newspaper, containing local, national, and international news and features, sports, business, editorial, and travel sections, plus a wide assortment of online resources. Hawaii Public Radio (KHPR - 88.1 FM, KIPO - 89.3 FM) - The mission of Hawaii Public Radio is to educate, inform and entertain by providing services to Hawaii, the nation and the international community that would not otherwise be available. 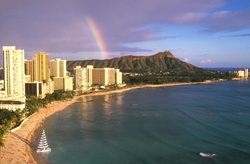 University of Hawai‘i at Manoa Homepage - Everything you wanted to know about UH Manoa and more. University of Hawai‘i System Website - Find out about the entire UH system with its 3 universities and 7 community colleges. Hawai‘i State Government Homepage - Everything you wanted to know about Hawai‘i and more.